Hello, everyone. I’m writing this so that I can say something in defense of The Brothers Grimm. And I don’t mean that movie with Matt Damonand Heath Ledger. I don’t think anyone could defend that thing. What I’m talking about is the body of work regarding German folk tales compiled by the acclaimed scholars and linguists Jacob and Wilhelm Grimm (did you know that there’s a Grimm’s Law in linguistics named after these two? Bet you didn’t). 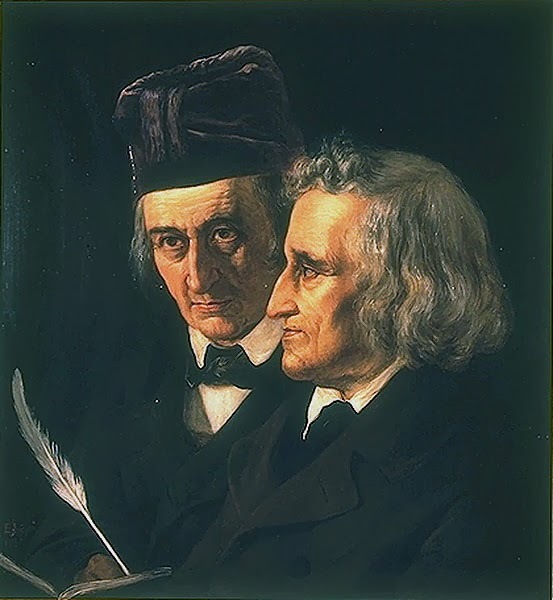 Jacob and Wilhelm Grimm were scholars but also proud Germans. At one point, these two decided to go out and collect traditional German stories as a means of showcasing an oral literature that was typically German. Did they succeed? Well, sort of. But that’s an article for another time. Anyway, the end result was a collection of over 200 stories (my copy of The Complete Grimm’s Fairy Tales has 210 stories, but there’s complete and then there’s complete). Now, what I’ve come to defend, or maybe refute, is a misconception about the Grimms’ work. Here’s the deal. In recent years, people have rediscovered the writings of Herr Grimm and Herr Grimm. Specifically, they’ve rediscovered the stories that they thought they knew because of children’s adaptations of those stories. You know the ones. They’re the animated movies with lots of singing and wisecracking animal sidekicks. The kind usually associated with a pair of black mouse ears. Now, upon rediscovering these stories, they’ve noticed that they can be more visceral than the cheery versions they knew. There can be more violence and the villains of the pieces will sometimes get physically punished in very creative ways. This has led the Brothers Grimm to be regarded as writers of dark, scary and sometimes psychologically disturbing fairy tales. You can see this reflected in the horror-themed comic book series Grimm Fairy Tales and the NBC police procedural fantasy series Grimm which recasts the Grimms as hunters of monster-ish creatures called Wesen. There’s only one problem. Oh, sure, there are some real doozies of dark tales in that collection. 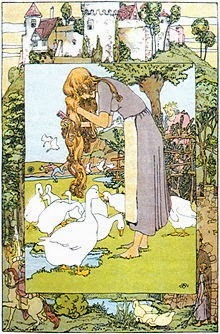 “The Goose Girl” (pictured above), “The Juniper Tree” and “The Girl without Hands” come to mind among others. That’s not including the creative punishments given to the villains in “Little Snow White” and “Cinderella”. There are even some so troubling that they’ve been cut from the modern collections entirely like the infamous “How the Children Played Butcher With Each Other” (I'm not even going to link to that one. You'll have to find it on your own). However, then we have other stories like . . . well . . . let’s use an example. 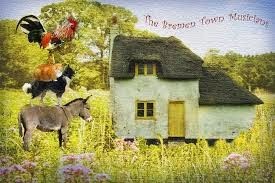 “The Bremen Town Musicians”. This is a quintessential Grimm fairy tale. It’s so German that the title even has a German city in it. Yet, it’s really just a short, rather silly, animal story. Another example . . .
“The Shoemaker and the Elves”. Another quintessential Grimm tale. Also a bit short, but entirely non-violent. The other "Elves" stories may get a little hairy, but they mostly end okay too. There are other, less well-known ones though. Less fantastic tales like “The Peasant’s Wise Daughter”, short fables like “The Old Man and his Grandson” and yet others. In some cases, the only violence is threatened violence that never actually gets carried out. Such is the case of threatening death to the suitors in “The Shoes that were Danced to Pieces” (also called “The Twelve Dancing Princesses”). In some cases, the Grimms didn’t even write down the darkest, most violent version of the story around. Let’s use “Little Red Riding Hood” as an example. 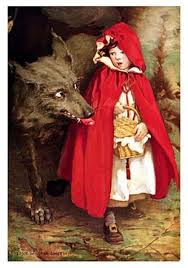 In the Grimms’ “Little Red Cap”, the girl is rescued by a woodsman who cuts open the wolf to retrieve her after she’s swallowed whole. Yet, in the earlier version by French fairy tale transcriber Charles Perrault, no woodsman comes. Red is just a wolf’s supper. And in the even earlier version “The Grandmother’s Tale”, well, I’m not even going to describe the creepiness of that tale. You can read it and the Perrault version here. 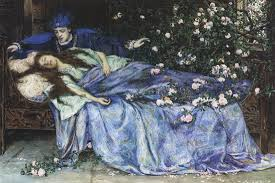 The “Sleeping Beauty” story is another example. The Grimm version “Little Briar Rose” is a straight-forward tale about waking a princess. Yet, in Perrault’s version, "The Sleeping Beauty in the Wood" the princess has an ogre for a mother-in-law who wants to make short work of her and her children. And in the Italian “Sun, Moon and Talia”, the prince does something with the sleeping princess that would likely get him locked up by modern moral standards. I love the work of the Brothers Grimm. In compiling their tales, they put together a well of fantasy concepts that people are still drawing from. It’s a treasure trove of great European folk tales. However, what I’m driving at here is that the collected fairy tales of Jacob Grimm isn’t a unilaterally dark, violent piece of work. In fact, it’s best to not necessarily look at it as one work at all. It’s 210 different works with each story having it’s own tone and merits of its own. Each story ought to be judged by itself. These stories were meant for all different people, both young and old. Some were comedies, others tales of terror or cautionary tales and others simply tales of fantasy. 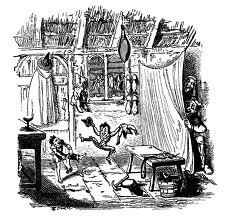 The folk tale was the whole of literature for common people at one point, not just a single genre. When you realize that, maybe you’ll realize that the Grimms weren’t so completely grim after all.